Happy Sunday morning. I though it would be fun to share a card I made for the February swap. There was some involved die cutting, (30 card swap) but once that was completed, it turned out to be a fairly simple card to put together that I don't think appears to be simple. I love the new Botanical collection in the Occasions catalog. It can look floral to jungle, depending on how you want to use it. Look how nice the sentiment stamped too! I was skeptical that a stamp area that large would have some overly lighter sections or not stamp at all. This has often been my experience in the past with many stamps I have tried. This worked great. All 30 sentiments I stamped worked great without any redo's. 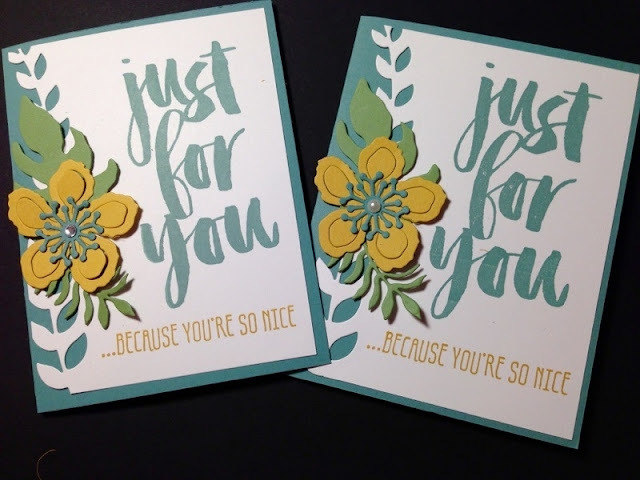 Once again I would like to remind everyone that we have Sale-A-Bration going on with Stampin' Up, and that means for every $50 spent from our annual and occasions catalogs, you get to choose one free item. It's also the best time to be a hostess or become a demonstrator. There are so many more benefits than before. I would be happy to help you out! My store is open 24/7 and I would be so happy to help you with your crafting adventure.